In recent years, few federal requirements have been as controversial as the mandate for what critics call 'bilingual ballots'. The Voting Rights Act of 1965 included a permanent requirement for language assistance for Puerto Rican voters educated in Spanish and ten years later Congress banned English-only elections in certain covered jurisdictions, expanding the support to include Alaska Natives, American Indians, Asian-language voters and Spanish-language voters. Some commentators have condemned the language assistance provisions, underlying many of their attacks with anti-immigrant rhetoric. Although the provisions have been in effect for over three decades, until now no comprehensive study of them has been published. This book describes the evolution of the provisions, examining the evidence of educational and voting discrimination against language minorities covered by the Act. Additional chapters discuss the debate over the 2006 amendments to the Voting Rights Act, analysis of objections raised by opponents of bilingual ballots and some of the most controversial components of these requirements, including their constitutionality, cost and effectiveness. 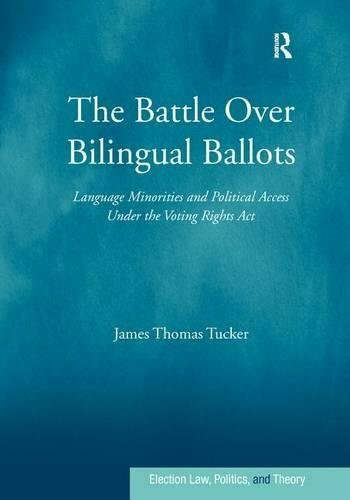 Featuring revealing case studies as well as analysis of key data, this volume makes a persuasive and much-needed case for bilingual ballots, presenting a thorough investigation of this significant and understudied area of election law and American political life. View More In Foreign & International Law.